Nope, it's not that 'famous Christmas Lists'...it's actually a tag!! Tada!!! Anyway, I got tagged by 3 lovely ladies so I felt that I probably should do the tag already, eh? Thanks to Joyce of PinayMamas' Diary, Beth of All about Elizabeth and Cecile of ...Life is Good and Beautiful for passing on this tag to me. 1. Pick your sweetest picture when you were still friends and post it on top of the questions and answers. 2. Another pic now that you are together post it after the questions. 3. Share to how many friends you like. 5. Let your hubby read it too! 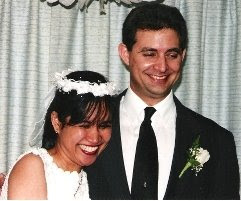 --> Can you remember the day you first met your hubby? Online...I sent him a message on April 21, 2001, he replied soon after. 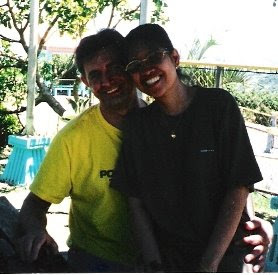 In person, we met for the first time on June 11, 2001 when I picked him up at NAIA at about 4 AM. Not very specific, eh? --> Were you attracted to him? --> Were you friends before he became your bf? Friends? Not sure if you would call it a friendship...but there's something...not quite sure what to call it. We 'connected' let's put it that way. --> What was the sweetest thing he did for you? He married me? Hahaha...how about traveling to the Philippines, his first time ever out of the US, to meet me and the family. His family was against his travel plans because news of foreigners being abducted were rampant at that time. He did anyway. --> What are the things about him that you are thankful for? He is very hardworking...responsible...faithful....ambitious [and he does something about it, too]...and a nut case [in a good way]. I can't imagine being married to someone who cannot make me laugh. That would be one boring life, eh? Now, who do I tag??? How about...Umma, Ate Beng, Cathy, Darlene, Eds, Honey, Mitch, Ruby [PinayMommyOnline], Ruby and Juliana. How about that ladies? Care to share how you and hubby got together? hello mommy, thanks for doing the tag! Your family is so cute mommy!!! Ahhhh... thats the magic of LOVE Mommy J..no matter how distance separates you, God will find a way if it is meant to be. Super guapo naman ni hubby mo, he looks so sweet and loving. No wonder ur little princess is a stunner.. beauty runs in the family... what a great combination. Hi Mommy Jul. Will sure to do this one. Thanks for tagging me!!! How's you week so far. It's not as cold here today but wet. All the from yesterdays's ice are now melted. Oh, I forgot. I love all the photos. Sweet nyo naman. 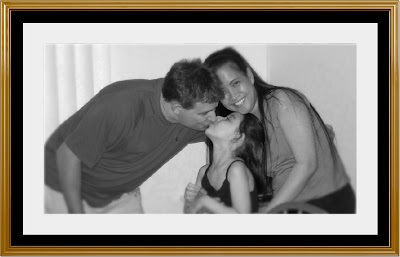 Jules, thanks for posting your love story :-)i loke it! Hi Ate J.. Miss my hubby.. wish ganun lang kadali yung paper works namin... btw hubby plan to be here next year prolly for good.. :) yehhey!.. I will give u a buzz te when I'm done.. muaahh! Thanks so much for this. I do appreciate being tagged by you. I've been tagged already but haven't posted yet. 'Will do this soon. Sobrang ganda ng family mo, J. Perfect combination talaga kaya perfect sa ganda ang bunga!Dapat pinaparami ang ganyang lahi! ganda ng pics, ang gganda ng lahi---hehehe! and also the love story-ganda din! thanks for doing the tag!!! ay sows! 3 days pa lang nagkita nakahawak na sa baywang! lol! i had to come back kasi medyo nalito ako. you said "his 3rd day here and the day we were to fly to US" -- you mean he fetched from Pinas then got married in US? Beautiful photos! You have a lovely family Mommy J! Hi pretty mommy Jul, love magic turns every negative thing to good! Wow, sweet as in super! ayan ang dami kong nalalaman sa iyong happy love story. More happiness! wohooooo , love is in the air hehehe... love the latest pic, so sweet!